Mark Vincent is a quiet member of our ward. He is the CFO for a GAF, a company in town that manufactures a plastic sheeting which goes underneath shingles on roofs to waterproof roofs. His wife, Laurie Vincent, was our first Ward Choir Director, a previous Hillcrest Ward Relief Society President, and a very proud descendent of my Mom’s Great Grandfather, John George Hafen. I do not remember how it came up, possibly at a Ward Dinner Group, but I found out Mark likes to write poetry. Andrea told him I like to put poetry to music. He provided me copies of several of his favorite poems. 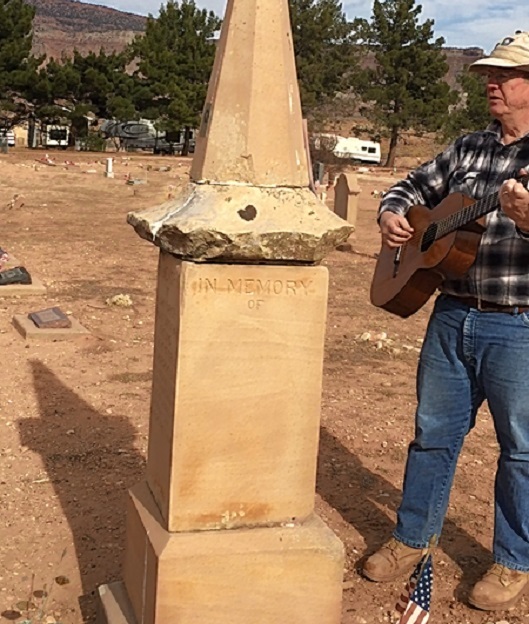 I selected one about the Pioneer Cemetery where John George Hafen and many of his descendants are buried. It has been less than a year ago when I put this song to music. I have sung the song to myself several times since then, and I made a recording of it and sent it to Mark. My reaction to the words and the music has been the same as Mark’s: “I cried when I listened to it.” It is special to reflect: “To walk among these windswept stones;” where “a pioneer, interred beside his bride;” and “a woman works with tender, loving care;” at “this hallowed knoll out on the edge of town;” were “here, row by row, ancestors rest in peace;” in this pioneer cemetery. The image to the left shows me playing my guitar, reading the music which was taped to a monument, and singing the song while Andrea recorded it (the video), shortly after I wrote the song. This was on our way home from a Southern Utah Rock Club rock hounding trip to the Hurricane Mesa where we collected a lot of petrified wood, which is now outside my office window. 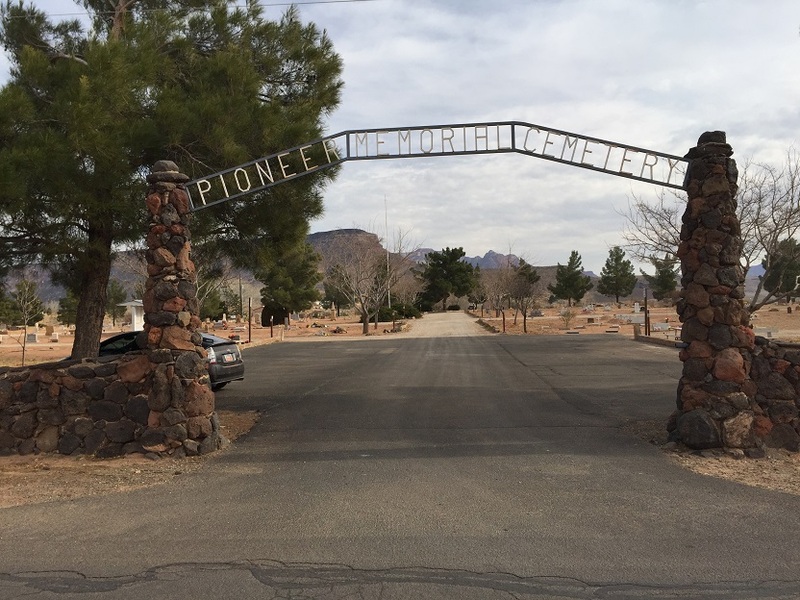 The photo, the movie, and the extended image of the entrance to the Pioneer Memorial Cemetery were taken at Virgin, where one of Andrea’s ancestors is buried. Like the cemetery in Santa Clara, it is a Pioneer Cemetery. A goal is for this site to be interactive, for others to record their versions of the Psalms, or provide images or videos which explain a Psalm better. E-mail images, audio, or video to submit@psalmscountdown.net. By making a submission you agree to release copyright and to allow W3D to publish your submission, acknowledging posting of your submission is entirely up to W3D. © 2019 W3D - DBA Psalms Countdown.